I used to subscribe to JazzIz Magazine for a source of new artists and pieces. Each magazine comes with a CD containing cuts from various artists. The problem was that the number of cuts that appealed to me were small, I didn't read the magazine, and it was expensive. So, finally, I got interested in satellite radio. Besides wanting a source of contemporary jazz, I commute about an hour a day. During that time, I'm either listening to news or switching across the dial looking for some station that (a) is not running a commercial and (b) is playing a tune that's appealing. I waffled around for a while, trying to decide which satellite service I would use, what receiver I would buy, and if I really needed satellite radio. To make the selection more difficult, there are two competing providers of satellite radio service: XM and Sirius. Add to that, the type and variety of receivers. I decided I wanted an add-on receiver that could be used in the home or car. I drive a 1990 Eagle Talon, and the room for mounting add-on systems is very limited. The other option was to replace the car receiver with one that was satellite ready, but that would prevent easily using the unit indoors. I had pretty much punted on getting satellite radio when I saw an ad for the Delphi Roady, a small add-on receiver for the XM service. I was ready to ask for one for Christmas when I decided I'd better be sure that I would be satisfied with the XM service. Both XM and Sirius have a way to preview their mixes on the web. With Sirius, you can listen to the music channels in real time. On XM, you can listen to a simulated sample mix. So, I started previewing the streams I thought I'd be interested in. I spent most of my time listening to the contemporary and smooth jazz streams on both services. And, like most everything else, there is no perfect service that would only play the music I wanted to hear. The results of my evaluation are as follows: Sirius costs more. The smooth jazz streams for both services play too many R&B vocals that do not quiet fit the genre. Sirius does not have a new age stream, but XM does. Sirius has some NPR programming such as Car Talk, which XM does not have. There are many other differences that don't matter much to me. A more detailed comparison can be found at 13donuts.com. Note that XM dropped commercials from its music streams. So, I finally decided I liked the Sirius jazz programming better. But, since XM only had sample broadcasts and since the programming was similar, I'm still not sure, for me, if one service was really better than the other. But, with all that said, I'm pleased with Sirius. Once I decided on Sirius, I had to find an add-on receiver. There was no Sirius receiver that was comparable in size to the Roady. Also, the Roady doesn't require a docking station. That's a nice feature, but I wonder if you carry the Roady from house to car to house often if you won't stress the connectors on the receiver. I had this happen with a ham radio HT I used in my car before I got a mobile rig. I decided on an AudioVox SIRPNP2 receiver, which I describe below. The three Sirius satellites are not fixed in the sky like geosynchronous satellites, but have high elliptical orbits. (See Sirius Satellite Orbits.) For home operation with the antenna near a window, this means that an antenna position that works well in the morning might not work at all in the afternoon. The solution is to mount the antenna at a position where it has a clear view of the sky so that as the satellites move, your antenna has a clear line-of-site path to one of the satellites. A nice feature of Sirius is that once you subscribe, you can listen to the music streams over the internet. (If you're not a subscriber, you have to restart the player every 15 minutes.) If you work at a company that doesn't mind your soaking up network cycles for music, this is a nice feature. Sirius is also cool because it sounds like "serious". You can make all sorts of lame puns about things like "Sirius Music" or say, "I'm Sirius about satellite radio." I finally decided on the AudioVox SIRPNP2 receiver. I received one for Christmas 2004, along with two docking stations: one for home and one for the car. The receiver has a nice display that shows the current song name and artist along with the channel number and stream name. There are three banks of 10 presets that can be accessed by the 0 to 9 buttons on the unit. The Band button selects the bank of presets currently mapped to the buttons. There are a number of ways to scroll through the streams: by number, by category, and in preset order. You can also preview the track information on other streams while listening to the current stream. My favorite feature is the set of 20 memories for song tittle and artist. With a press of the Memo button, the track and song title are saved. Later, e.g., when you're not driving, you can scroll through the memory to find out what that great song was you heard while driving. Optionally, you can have the receiver alert you with a beep when any of the memory tracks are played on a stream you're not listening to. At that point, you click one button to go to the other stream. There are several docking station options. The SIRCK1 docking station is for use in a vehicle. 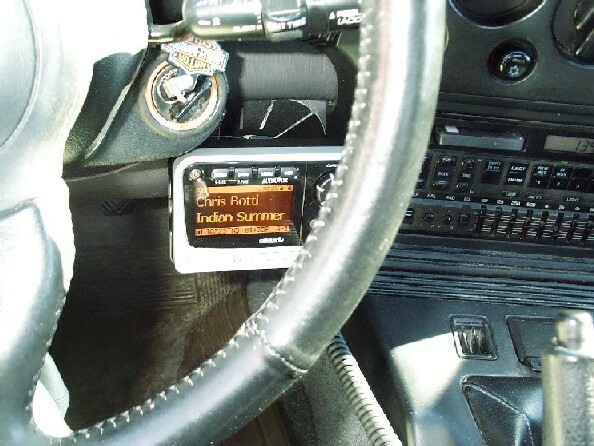 It has an FM modulator that broadcasts to your car radio, or you can use an audio cable if your car radio has an aux input. 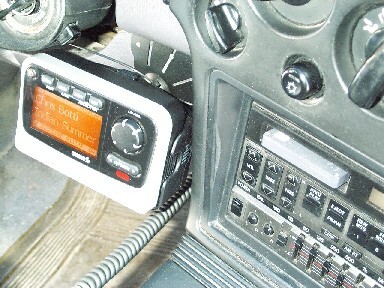 The SIRCK2 docking station is similar but without the FM modulator. Both these come with a cigarette lighter adapter cable. The SIRHK1 home docking station comes with a 12V power module and an audio cable that connects to your home stereo. All the docking stations come with a satellite antenna that is about the size of a computer mouse. AudioVox also has a boombox amplified speakers unit for the SIRPNP2. I used the SIRCK1 in my home for a week or two, and the FM modulator did a great job of broadcasting the Sirius audio to a number of FM receivers in my home. The SIRPNP2 dissipates more heat than I expected. It makes a great hand warmer in winter when you carry it from the car to the house. I mounted the SIRCK1 docking station in my 1990 Eagle Talon. There is little room to mount the receiver where the controls can be reached and where it's visible. I chose to mount it between the FM radio and the steering wheel. The display is obscured by the steering wheel, but that's okay. I don't want to be distracted when I'm driving. But, I can access the presets or put a song in memory without looking at the receiver. I might try a Pro.Fit UltiMount later. You can mount the docking station using screws or by using the 3M double-backed adhesive attached to the mounting bracket. I was very careful following the mounting instructions. The adhesive stuck to my dash properly, but it came loose from the bracket. I think it was not properly applied during manufacturing. The adhesive that remained on the dash was not very hard to remove. I found a roll of 3M Heavy Duty Exterior Mounting Tape at a local arts and office supply store. The tape looks very similar to the adhesive that came on the mounting bracket. I cut pieces of tape to fit the bracket, and it seems to have worked well. A friend suggested that when summer comes and the car gets hot that the adhesive might fail. But, for now at least, the tape is doing fine. See my assessment in 2008. The home docking station comes with a 12V power module and an antenna. As I noted above, the Sirius satellites are not stationary in sky, so placing the antenna near a window might work for a few hours. Then, you might lose the signal and have to move the antenna a few inches to regain the signal. This works fine for me now. The real solution is to place the antenna outside with a clear view of the sky. While the SIRPNP2 is operational, there are three signal strength bars in the lower left corner. If there is no signal, an X appears there. Otherwise, you get the relative signal strength indication: one bar, two bars, or three bars. If you use the menu "Antenna Aiming" feature, you get a relative signal strength meter with 10 levels, but unfortunately, you still only 4 possible level configurations giving you the same information as with the other metering. If they utilized all ten levels, it would probably be possible to find an optimal position at a given time. Anyway, I don't mind moving the antenna occasionally. I'll consider placing it outdoors in the spring. After using the Sirius service and the AudioVox SIRPNP2 for two months, I'm pleased. I have not used XM radio, so I can't do a fair comparison. The programming streams aren't perfect, and probably repetitious, but broadcast radio suffers the same problem and has commercials to boot. After having Sirius service for about four years, my receiver developed an intermittent problem. It seems like the cheaper replacements don't have song memory, so I looked for and found a factory fresh SIRPNP2, and I was back in business. Not long after that, Sirius canceled the Planet Jazz channel. I would typically listen to the Jazz Cafe and Planet Jazz, swapping between the two when the other became too repetitious or was playing something that irritated me. The company response was that there was other jazz programming, so doing without Planet Jazz should not be a problem for me. I canceled my subscription, and it expired on Christmas Day 2007. I have high hopes for satellite radio and perhaps things will look brighter in the future. Until then, the satellite providers must look to shows that appeal to large markets. One of my reasons for subscribing to satellite radio was to find a source of new music. For awhile, I did hear some new music I liked, which resulted in the purchase of new CDs and iTunes songs. Without Planet Jazz, I wasn't hearing much new music I wanted to purchase, or perhaps I was tired of the streams available on Sirius. I have a car stereo that plays MP3 files from a memory stick. I have found new sources of music that I can copy to the memory stick and play while I commute, so I find I don't miss Sirius very much. My only irritation at Sirius is that one of their representatives called me at home to ask me to resubscribe after my relationship with them was over. I think this might be a violation of the FTC "Do not call" regulations. I was also spammed after I canceled my subscription, and it took me several tries to get off their spam list. I am happy to report that the 3M Heavy Duty Exterior Mounting Tape I used to mount the docking station in my car worked great. Even after four hot summers, it's still holding the mounting plate in place. Benjy Cline, 2/2004, updated 2/2008, ham at tuxcat.com.